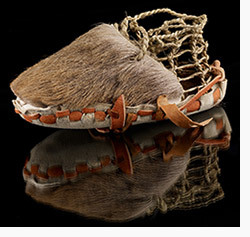 I ordered mine from the National Museum of Denmark about twenty years ago and pick it up often to marvel at the brilliance of the minds that figured out so many unique and beautiful ways to cover their feet, and sometimes to attempt to duplicate their creations – the subtitle is: An Archaeological-Ethnological Study Based upon Shoe Finds from the Jutland Peninsula. I believe the book was published post- humously. Thank you, Margrethe Hald, for leaving such a gift behind. with sharp hooks in a row. gave shoes to the needy poor. Last night I was scrutinizing a pair of shoes a woman was wearing that looked similar to a Roman latticework sandal – she said they were made by Mia, but I couldn’t find a photo of them on the internet. The shoes in the photo below are somewhat similar to the shoes I saw, it’s a pair that I’d like to work out the pattern for some day. I have been most interested in his shoes, in fact I’ll dig up an article about them and post, but in the meantime his shoes have been reproduced for the exhibit. 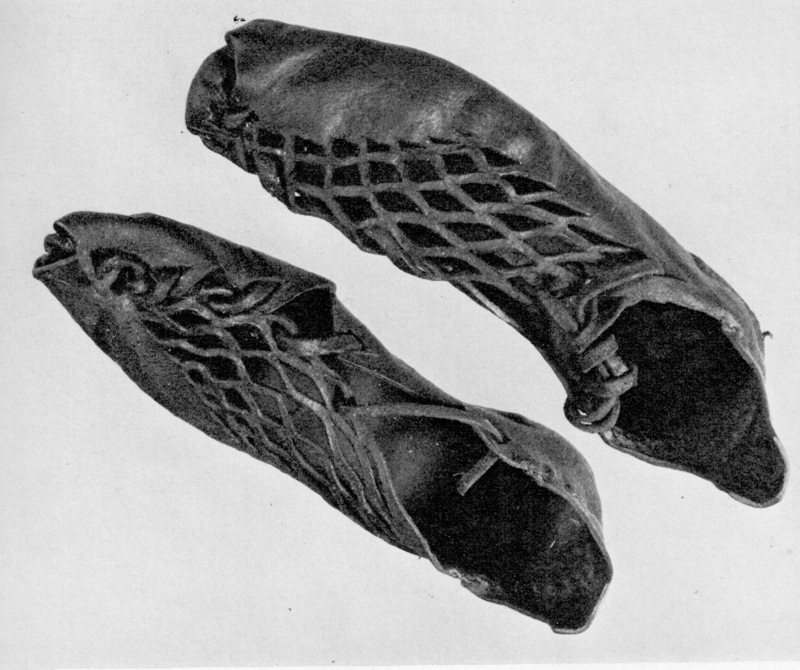 Here’s a photo of them – I’m fascinated by the way the sole is molded upward and held in place by a strip of leather woven through it – now I want a pair! The Rhineland-State Museum for archeological, art and cultural history in Bonn is currently showing a special exhibition about footwear. ‘From Ötzis’ shoes to high heels’ 400 samples can be seen here. The exhibition demonstrates that for us as humans, shoes have an essential jacketing and protecting meaning and at the same time are a kind of jewelry and serve as a way of self-expression. Shoe loans of famous people from Picasso over Jürgen Klinsmann to Lady Gaga can be seen there as well as women’s shoes of the Rococo or soldier’s boots of the Roman Age. Someone who is interested in shoes will find a rich fund of information and inspiration visiting the exhibition. 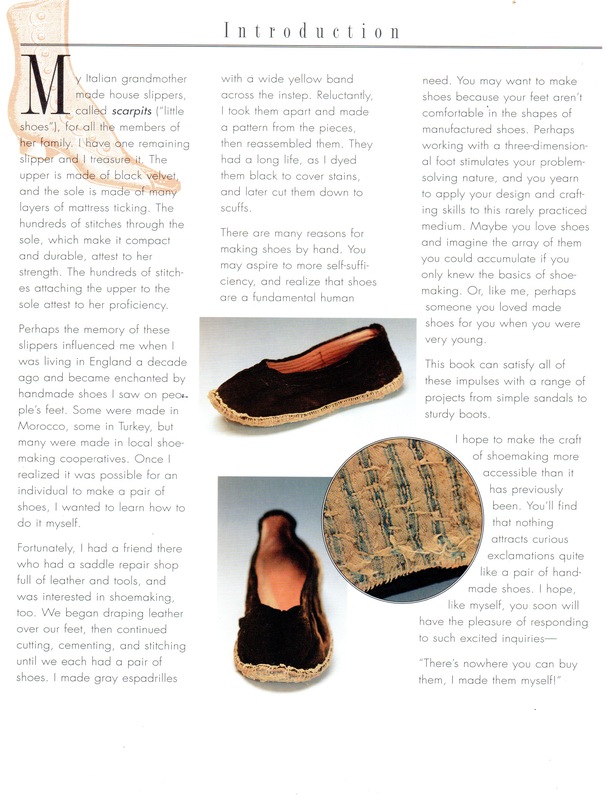 At a Renaissance Faire in CT a few years ago, I ran in to a fine leatherworker named Angus who surprised me with the news that he had made himself a pair of shoes by following the instructions in Crafting Handmade Shoes. When I saw them I was amazed; they were made of vegetable-tanned leather that he had dyed black, then very skillfully-lasted. 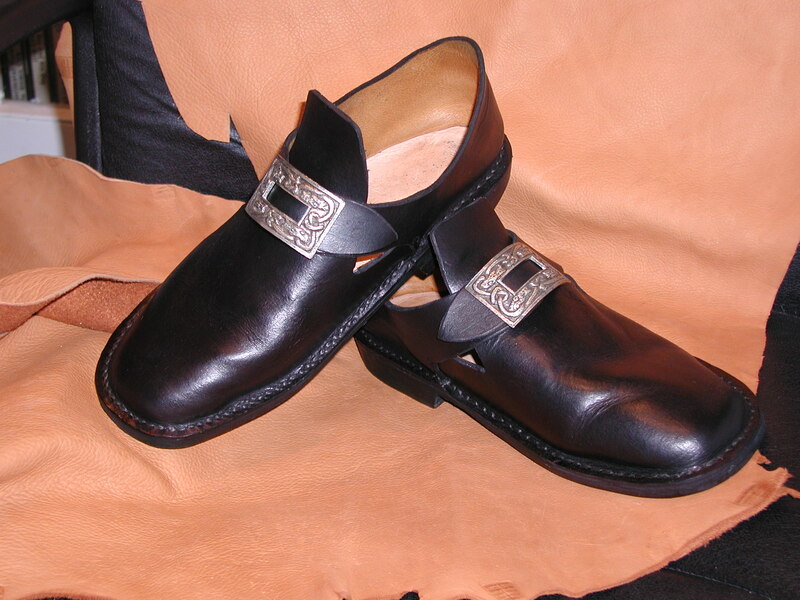 He added a layered vegetable-tanned heel and fastened them with beautiful buckles, to complete the artisan-crafted look of another time and place. Here is a photo of his shoes.